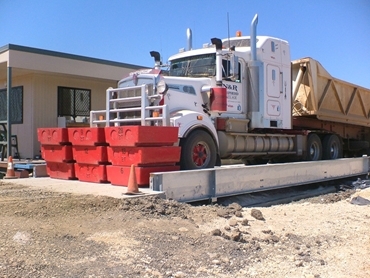 Accuweigh supplied a single deck public weighbridge for installation in Moranbah, Queensland. Supplied by Accuweigh’s QWM branch in Brisbane to their client MCG Quarries, the public weighbridge is capable of weighing trucks and trailer combinations up to and including small road trains. The QWM-manufactured public weighbridge has been certified to allow issue of public weighbridge tickets. MCG Quarries specified a public weighbridge to provide a service to local companies that didn’t have access to a local weighbridge. MCG provided their own local civil contractor with QWM completing the weighbridge assembly, testing and public weighbridge certification. Measuring 28 metres long by 3.5 metres wide, the single deck public weighbridge is supported on eight heavy duty AccuCell weighbridge load cells with IP68 rating for complete hermetic sealing. Due to its remote location away from mains power, the public weighbridge is powered by a UPS system operating off a local generator. The concrete deck weighbridge has been manufactured in Brisbane by Accuweigh’s QWM branch that specialises in manufacturing weighbridges for extra heavy duty weighing applications. Ticket Aid Pro public weighbridge Software was supplied by Accuweigh’s own weighbridge software company, AASoftware to ensure compliance with public weighbridge regulations. A leading Australian supplier of weighbridges, Accuweigh operates a network of eight branches covering mainland states providing superior product support on all weighbridges and industrial weighing equipment.